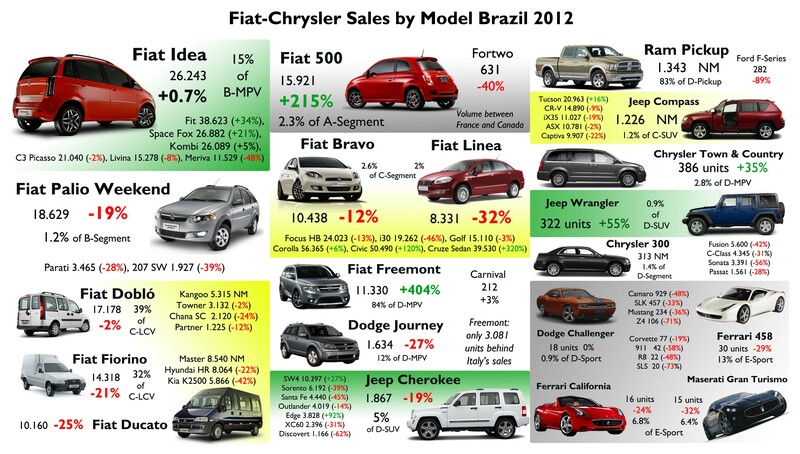 Brazil was world’s fourth largest car market and the second for Fiat-Chrysler in 2012. Before Fiat bought Chrysler, this market was already Fiat’s number 1 and saved Fiat from bankruptcy 10 years ago. It is perhaps Fiat’s most dynamic market and where most of the effort is concentrated. Due to the fact that it is a fast-growing economy, Brazilian car market has had a terrific performance during the last years and it seems it won’t stop in the coming years. It is world’s 6th most populated country and the first in Latin America. That mix of healthy and growing economy with big population is the key for the coming years: a lot of Brazilians are becoming part of a strong and big middle-class society that will need a car. The big potential is part of mid and long-term car makers forecasts and is calling new players. For Fiat it means a great opportunity to come (specially taking into account the next World Cup 2014 and Olympic Games in 2016), but it is also a big challenge to maintain its pole position in a market that is getting full of competition and very interesting proposals from other important car makers. For now let’s concentrate in 2012 results and the forecast for a tough 2013. One more year and one more record. Once again Brazilians bought a lot of cars allowing the market to reach a record of 3.63 million units (passenger and LCV), up 6%. This analysis will concentrate in passenger cars plus LCV (Comerciais Leves in Portuguese), as larger trucks and buses are considered another type of vehicles. 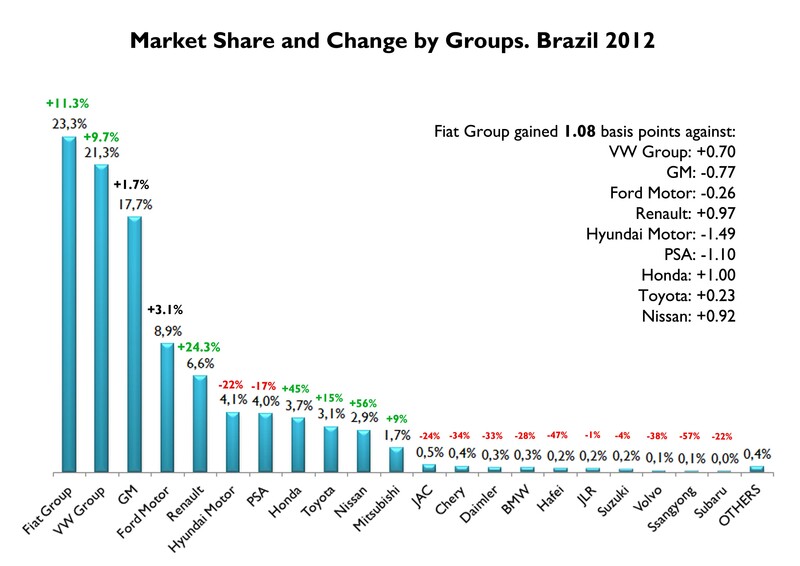 In terms of growth Brazilian car market is below USA, but did a better work than any European market. Compared to BRICS markets, Brazil is ahead of China but is behind Russia, India and South Africa. Considering units sold, Brazil ranked 4th after China, USA and Japan, and before Germany. All of these results allowed this market to become an important production center in the region attracting investors from Europe, America, Japan, Korea and China aswell. Nevertheless the country is still far away from reaching the high car/person index there are in the developed world, which at the end means good news as the potential for growth will last for more years. Going back to the results, last year’s growth was better than previous year change, when the market was up only 2.9%. The move up was possible because of passenger cars performance, up 7.44% in 2012-2011, compared to -0.1% in 2011-2010. One year ago, passenger cars counted for 77% of the total. In 2012 they represented 78% as LCV lost market share. 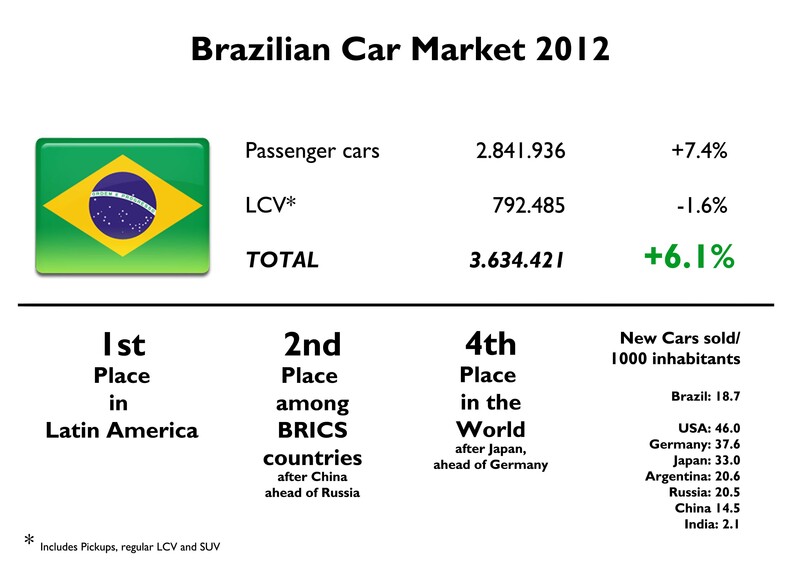 More passenger cars means more offer and that’s what happened last year in Brazil. However, this country continues to be a relatively closed car market as tariffs for imported cars are still very high compared to local products. That’s why only 3.6% of total sales are imported cars, which is nothing. This difference in the IPI tax has allowed the country to attract more investment and boost local production, just as it happens in China and India. Then, the new offer comes from locally brands: more Chevrolet, more Renault, more Ford, and new players, such as Hyundai which introduced its very first locally made car to compete directly in Brazil’s largest segment. These new cars benefited from lower IPI taxes and increased the share of those cars with engines between 1.0 cc and 2.0 cc. Brazil classifies its sales according to the engine size as the IPI is applied not only considering the origin of the car, but its engine. That’s how passenger cars are divided into 3 groups: those with engines under 1.0, which counted for 42% of total passenger cars sales; those with engines between 1.0 and 2.0, 57.5% of the total; and those with bigger engines, normally more expensive and imported, which counted only for 0.33%. From them, only 1.0-2.0 engines increased sales registrations year-on-year. Actually, overall Brazilian car market is up exclusively because of this kind of passenger cars. At the end, 99.66% of the cars sold in Brazil are powered by engines under 2.0 cc. It explains the development of down-sizing engines. The composition had some significant variations from the point of view of segmentation. Small cars continue to dominate but those B-Segment ones (sedan included) had the biggest gain compared to 2011 figures. Last year they counted for 42.3% of total sales, up 3.5 basis points, the highest growth among all segments. The good performance of the Palio/Siena, the dominance of the Gol and the arrival of new Chevrolets and Hyundai, added more dynamism and offer. In the opposite side, the city cars, or A-Segment, had the biggest fall in terms of share. In 2011 more than 682.000 units were sold (19.9% of the total). One year later almost 685.000 citycars were sold (18.9% of total). It means that Brazil’s A-segment, which is world’s third or fourth largest one, decreased its share in 1 basis point. The main reason was the tiny fall the Fiat Uno had. Other important segments are ‘C’ and Pickups, counting 11.2% each. And contrary to what happens in developed markets, SUV and MPV still don’t have important shares: 6.9% and 6%. SUV’s share is up 0.1 basis points, while MPVs drops 0.4 bp. In the case of SUVs, the growth is mainly explained by small ones, B-SUV, because larger ones lost share. Is the opposite to what happened to MPV, as small ones lost share while big ones gained. Finally, D, E and F segments are still marginal: the 3 of them counted for only 0.8% of the market, as they were strongly affected by IPI imports taxes (29.164 units, down 39%). 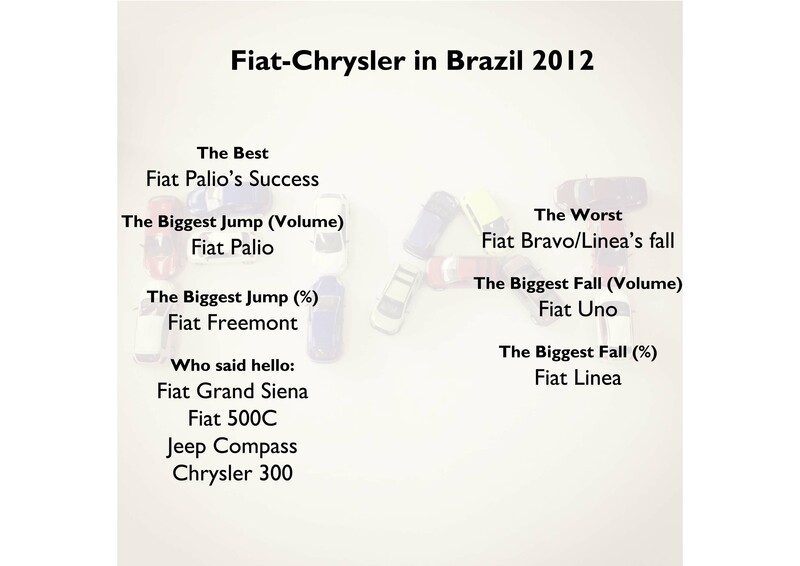 Fiat completed 11 years as the leader of Brazilian market. 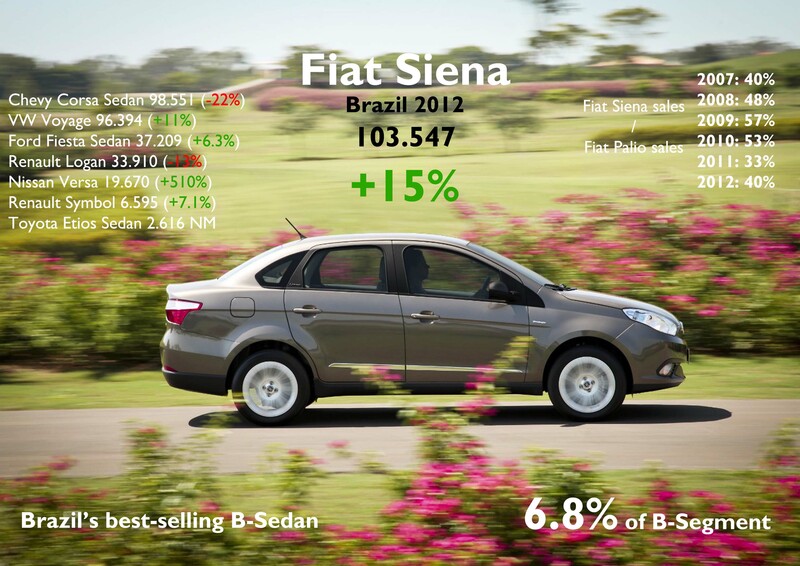 Thanks to the rising demand and Fiat’s continuous work, the brand was able to catch 23.06% of the market. This market share is the world’s second best of the whole group, after Italy, in a market with a strong potential for coming years. It also means that the brand increased its share by more than 1 basis point compared to 2011 results, and also the distance there is between Fiat and VW, the second largest player in Brazil. In 2011, Fiat was ahead of VW by 1.63 basis points, while one year later that difference was 1.92 bp. These are all good news that should mean even harder work in order to maintain that leadership. Of course those results don’t include other brands of the group, which are also on sale in Brazil. If Chrysler, Dodge, Ferrari, Jeep and Maserati are included, the market share rises up to 23.26%, or 845.337 units. The result in terms of units means that Brazil is Fiat-Chrysler’s second largest market after USA, and doubled Italy’s registrations, the third market. As I wrote in a post about healthy competition some months ago, the tough battle against VW and GM is what mainly explains the good position of Fiat in Brazil. They are continuously fighting for having the latest launch, the best car or the best innovation. That’s why Fiat is always moving with new models (in 2012 they launched the new Siena, the deep restyling of the Punto, a minor update of old Siena/Palio Weekend, and more featured Bravos and Unos), and aggressive marketing campaigns. In 2012 the whole group sold 11.3% more than the previous year, and Fiat brand counting for 99.15% of the total. The presence of Chrysler brands and Ferrari and Maserati is marginal as they all import their cars paying high taxes. However they had the highest growth, starting Jeep with 36% increase. It is certainly good to know that this brand had this result as there may be good possibilities of higher demand in the future as its products are built locally. 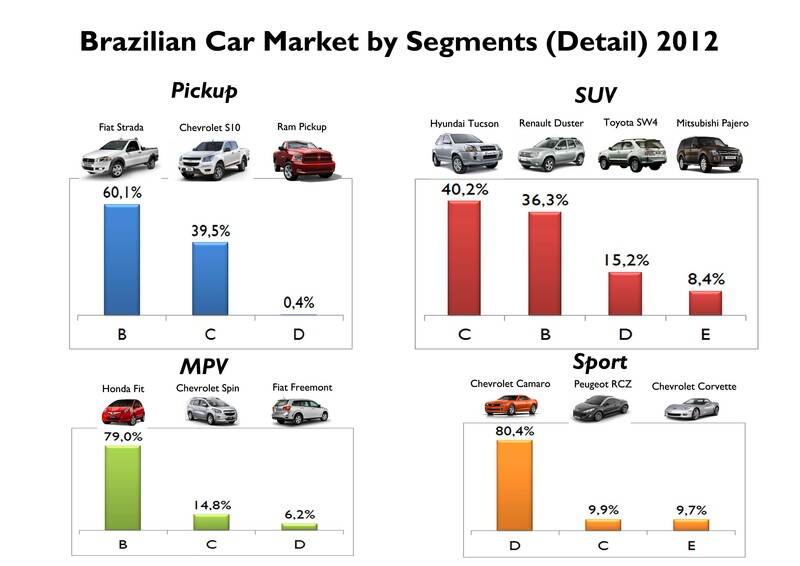 Anyway, Brazil is still far away from the big SUV penetration there is in countries like USA, China or even Europe. Fiat’s rise last year is mainly explained by one model: the new Palio. This model came on sale in late 2011 but it finally took off last year, up an incredible 76%. And as it counted for 22% of the group’s sales, it could offset the tiny fall the Uno had. Dodge had also interesting results, up 32% thanks to the Journey, whose sales are up no matter the introduction of its twin brother, the Fiat Freemont. 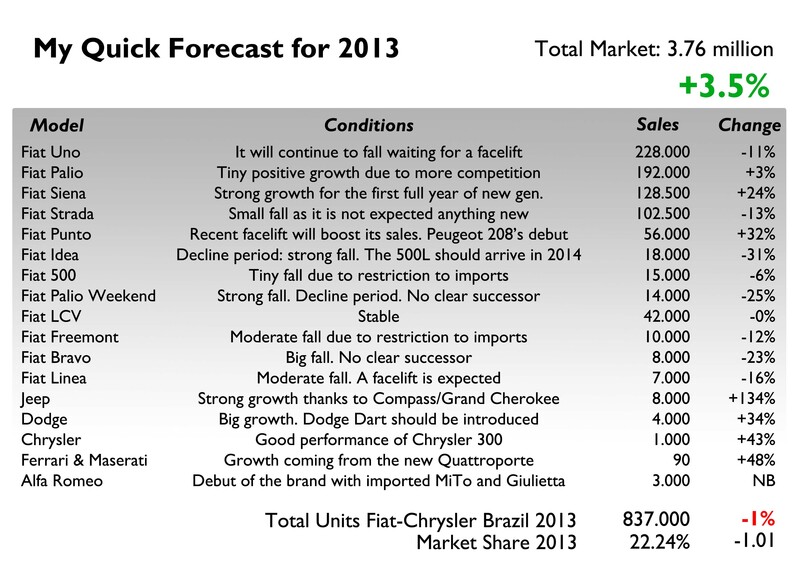 Chrysler brand did very good with the introduction of the 300, allowing it to increase its total sales by 9%. Unfortunately Alfa Romeo is not present in this market but it is expected to start operations in 2013 importing its MiTo and Giulietta from Italy. 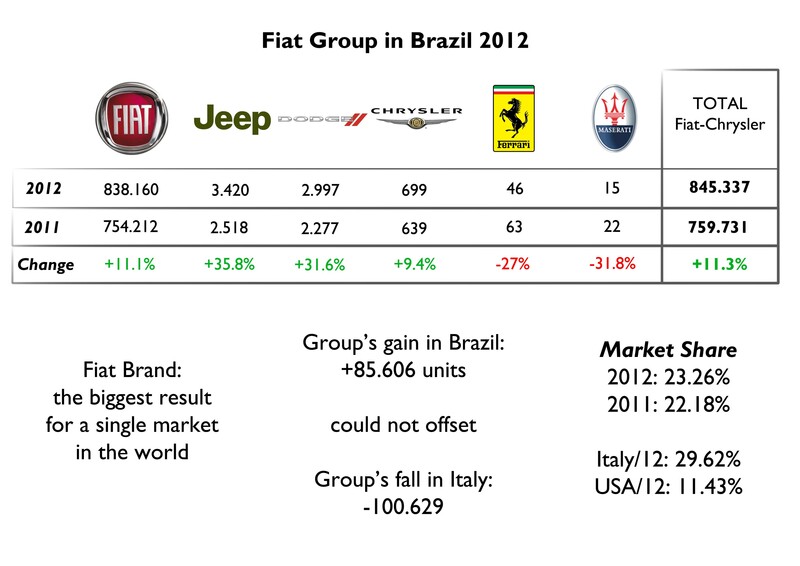 Fiat brand led also the growth among the 3 big from Brazil, Fiat, VW and Chevrolet. But its growth was lower than the big jump of minor players like Honda and Nissan, up 45% and 56%. And contrary to what happens in the rest of the world, Hyundai and Kia had important falls, explained by the fact that most of their models are imported. More and more competition for the coming months. Regarding segments, the position of the group is highly concentrated, just as it happens with overall market. Almost 76% of total sales correspond to passenger cars (from A to F segment), while pickups come second with 14% of share. LCVs count for 5% and MPVs for 4.7%. Notice that SUVs count only for 0.4% of the group’s sales, which is nothing compared to North America. 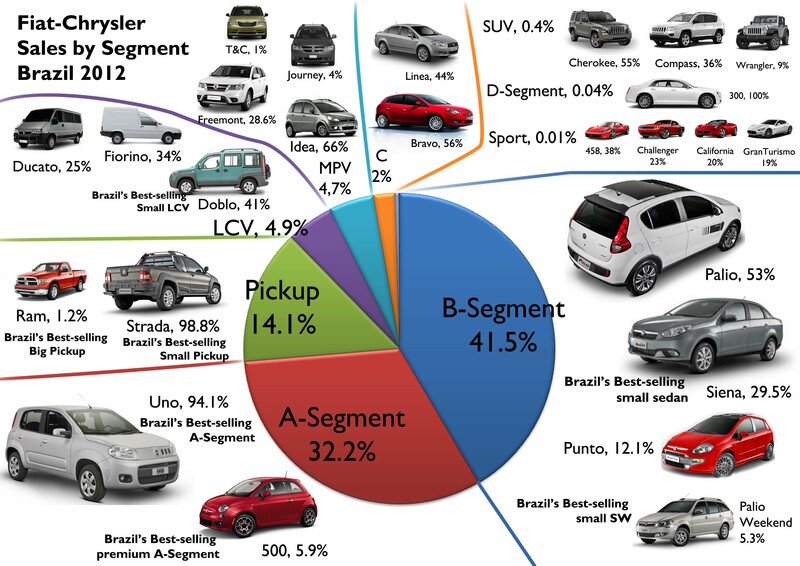 Among regular passenger cars, 55% of them correspond to ‘B’ segment, followed by ‘A’ segment with 42%. ‘C’ segment counts only for 3% of them, while the presence in larger segments is marginal. 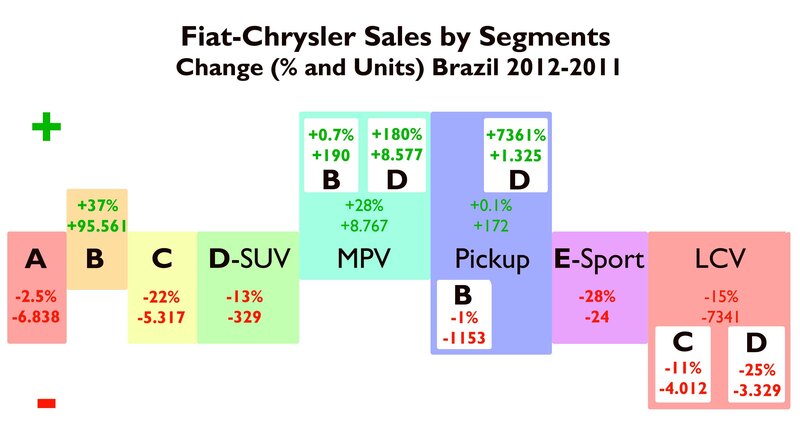 In other words, 42% of Fiat-Chrysler’s sales in Brazil come from ‘B’ segment, and 74% comes from A+B segments. In Italy that proportion was 71% in 2012. It is a big number that proves once again the Fiat’s strong dependence on small cars. It should also serve to rethink the strategy in larger segments, and take the strengths in small ones and use them in ‘C’ and ‘D’ segments. One more thing: SUV segment is still small, but it showed it has started to grow, specially in ‘B-SUV’, so Fiat should accelerate the introduction of the 500X to compete with the Ford Ecosport, Renault Duster and the future VW Taigun. Good and worrying news come from the range of models in Brazil. The good thing is that the launch of the second generation Palio/Siena has been a complete success. The bad side is that there may be cannibalism inside Fiat’s range. 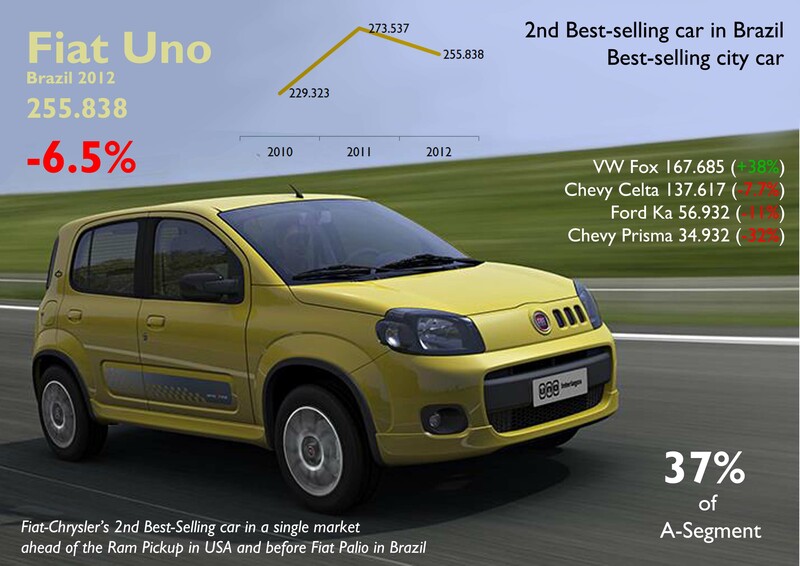 The success of the Palio could be affecting the performance of its best-seller, the Uno. 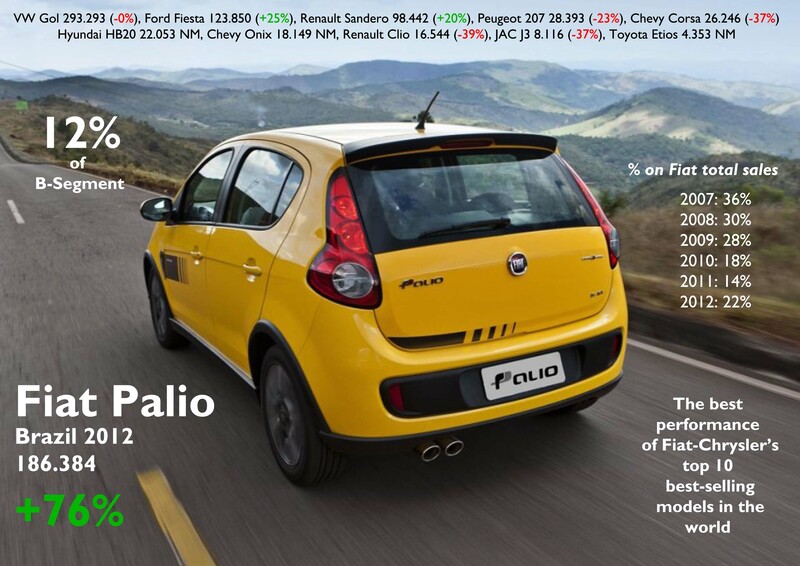 In fact the difference between them in terms of price may not be as big as it should: the cheapest new Palio 5 door is priced at R30.590 (11.600 euro), which is 6.4% more than the average price of all 5-door versions of the Uno under that price. In other words the difference between the A-Segment Fiat Uno and the B-Segment Palio is around 700 euros. Of course several things must be considered when doing this comparison, but having prices that close may be affecting the history of success of the Uno (see Price strategy and the impact on the latest models). Last year this car registration’s fell 6.5%, contrary to what happened to the Palio, up an amazing 76%. The Uno rules in Brazilian A-Segment, while the Palio is in third place in general ranking, and second in B-Segment, after the invincible VW Gol. The new Siena had also a wonderful start but as it was launched in May 2012, its total sales did not grow as Palio one’s. However it managed to overcome the Chevy Corsa Sedan and VW Voyage in the last months of the years. The strong competition the Palio/Siena have is their key of success, while the Uno, which rules without any strong competition (VW does not offer yet anything important in this segment), may be staying behind. A deep restyling should arrive in 2013. 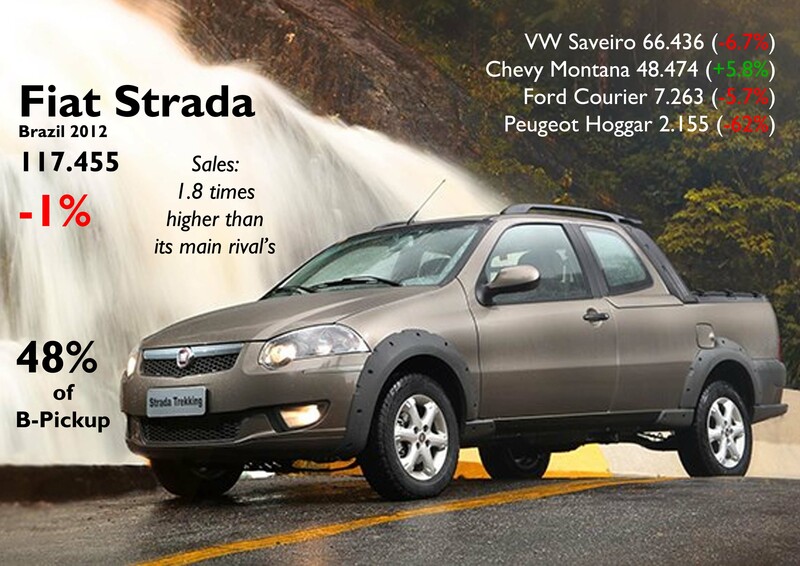 Another case of success is what continues to happen to the Fiat Strada. This small pickup is also the absolute leader of its segment (in 2012 its sales almost doubled those of its immediate competitor, the VW Saveiro), no matter the fact that is a very old model. In fact the Strada has been on sale since 1996 with several updates but without any complete change. However this car is the favorite pickup among Brazilians and last year more than 117.000 units were sold, just 1 thousand under 2011 record year. But Fiat must think twice when launching the new generation (if there’s going to be one), as this kind of cars, the B-Pickup segment is only popular in Brazil and creating a unique model for a unique market could not be profitable. At the end is a problem for all local car makers as their small pickups are most of them old. 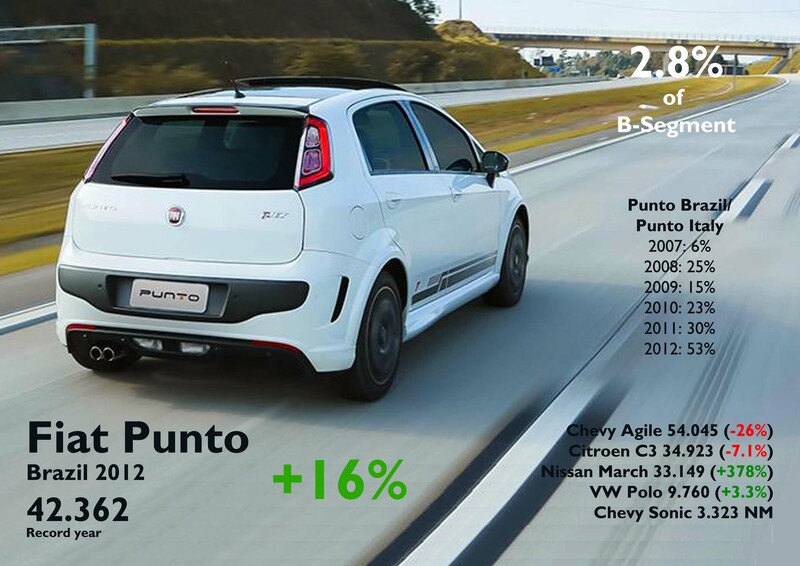 The next model in Fiat’s ranking is the Punto, which got its first facelift in mid 2012 and since then has improved its results. Last year its sales grew 16% and it was the best-selling car of its subsegment (premium B-Segment), thanks to interesting features and engines. The Punto is the unique non-cheap model that Fiat sells with relative success. Other cars in higher segments, such as the Bravo or the Linea, continue to rank far from the leaders of their segments, no matter they are excellent products. The Fiat 500 is the exception: it could reach higher volume sales if it wasn’t because of the imports quota there are for Mexican cars. In 2012 almost 16.000 units were sold, up 215% (almost as French volume). As it happens everywhere it is introduced, the 500 has become an iconic model in Brazil, but its high price has made of it a niche product. Between the Punto and the 500, there are the Idea, Palio Weekend and Doblo, which had bad results. Even though the Brazilian Idea has done much better than its twin from Italy, this small minivan does not rule in its segment and it seems it has already reached its top in terms of volume. That’s why Fiat should consider the introduction of the 500L in Brazil, which could have great results only if it is produced locally. The old Palio Weekend had one of the deepest falls as it did not receive the new generation as its brothers, the Palio and Siena. As it happens to the Strada, the Weekend has a very small market that may force Fiat to mull another concept for families. The Doblo, Fiorino and Ducato did not have a good year. They are all very old models that should be replaced for the latest products Fiat offers in Europe and that are working quite well in Argentina. Regarding expensive Fiats there are mix results: the Freemont had its first full year, with more than 11.000 units sold (3 thousand units behind the Freemont in Italy), which is not bad at all considering its price (starting at 32.600 euro). Of course the introduction of the Freemont means the fall of the Dodge Journey, down 27%, but still in the fight. In the other side there are Bravo/Linea couple with bad results. They are both produced locally and offer interesting features in their segments, but their rivals are doing more. The Bravo sold almost as much as it sold in Italy, where its results are a complete disaster. And the Linea, down a massive 32%, needs urgently a deep restyling (even better than the one presented in Turkey) to keep Fiat’s shy position in that segment until a proper successor appears. The origin of the models is extremely concentrated. Contrary to what happens in Italy and USA, where 2/3 of the cars sold by the group are produced locally, in Brazil 96% of Fiat-Chrysler’s sales come from local products. It is the result of government policies looking to boost local production and stop imports. Brazil is a closed market when importing cars, but is quite open when receiving FDI, foreign direct investment. 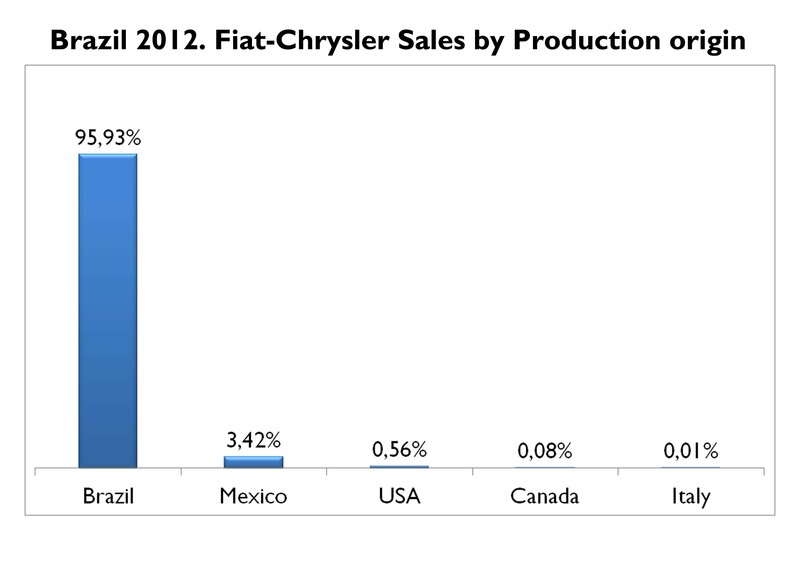 That’s why every key product Fiat wants to introduce in Brazil should be locally produced. This analysis considers the Palio and Siena as Brazilian made cars, even though some of them come from Argentina, where the Palio became the most produced car. However, as there isn’t data available, both models are included as Brazilian cars. But the group imports some of its range from abroad: Mexican products count for 3.4% of the total, making use of the automotive agreement there is between Brazil and Mexico. 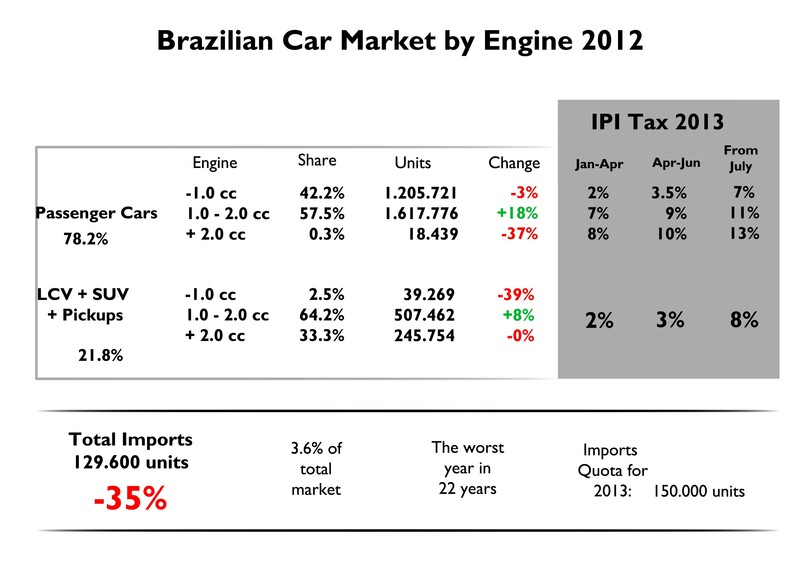 That’s how the 500 and Freemont/Journey can be sold in Brazil paying less taxes but with some import quotas per year. Then comes USA, Canada and Italy with marginal share. 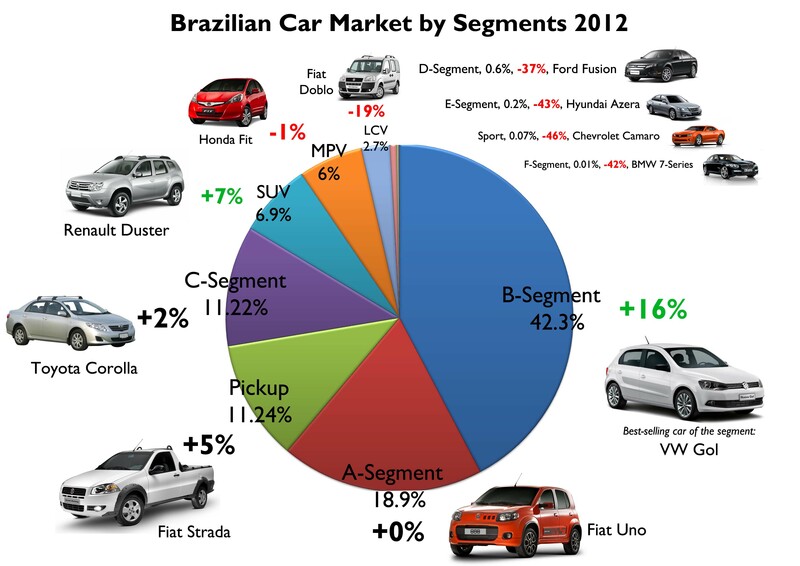 In 2013 Brazilians should continue to buy more cars but there may not be a big jump compared to 2012 figures. Two opposite forces should contribute to a little growth in total car + LCV sales. Low interest rates and Brazilian economic expansion will continue in 2013 as they get prepared for 2014 World Cup. This will offset government’s decision of cutting the IPI reduction starting January 2013. If those conditions remain, then total market should reach 3.76 million by the end of this year, up 3.5%. Fiat-Chrysler will continue to rule but will face some difficulties: it is not expected any big change in its current range as the group will focus on large and luxury segments in its worldwide strategy for 2013, while small cars will not suffer big changes or improvements. Thus, Brazilian offer will remain unchanged but competition will be harder. It means that Fiat and Chrysler will sell around 837.000 cars, down 1%, explained by a moderate fall on Uno’s registrations, stagnation of the Palio’s and better sales for the Siena. In other words, it is going to be another good year for Fiat in Brazil, but it won’t be a year of new cars and that’s why the group will have a worse performance than the rest of the market, which will be the place for new cars and more competition. This forecast includes passenger, LCV and SUV only. Based on current economic situation and what’s expected to come in the next months, Brazilian should be buying more cars with moderate growth as easy credit will continue to be available but IPI tax will have a moderate and negative impact. 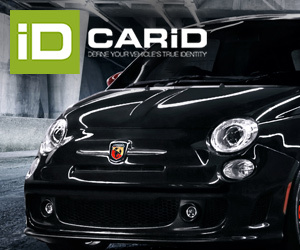 Fiat will rule again but will face some problems as no important all-new product is expected to be introduced in 2013. The Palio and Siena will do a good job but not as in 2013 because they will have more competition. The Uno will continue to fall waiting for a facelift. Alfa Romeo should start operations with marginal sales. Thanks Dario. I just want to analyze each market as soon as possible, but it takes time. Nice analysis. Out of curiosity, what do the import taxes add upto in Brazil? I can’t understand why the Bravo is not a success in any country! Here in Ireland it is so rare, yet first Bravo/Brava was very popular. Even Stilo was more popular! In Ireland Fiat now sells hardly any cars, very bad reputation. My first car was a Bravo, followed by Marea. Very reliable, except for electrics, windows, sunroof etc. were very poor in the Marea. A shame. Thanks Juan. But how much does it add up to, say for a Giulietta? If you take the CIF value how much does the Import taxes and the TIPI add to as a %? Strange that the Bravo isn’t doing great in Brazil. In EU one can say that the competition is tougher and more sophisticated. But are its competitors in Brazil any better than the Bravo?? Great article Juan (i’m Brazilian). About Giulietta, it will probally be sold as same price as Audi A3 (around 100.000 reais). It may be build in the new Fiat factory in Pernambuco. #1 No marketing. Fiat just dont ”like” Bravo, because i barely see anything on TV that appear Bravo. #2 Fiat factory is not Manufactures Fiat is not realizing produce every car, a Fiat Bravo has queued for more than 90 days. Last month, Fiat Bravo had a ”good” month, because people are sick of OLD focus and sick of the new i30 (bad engine with BMW price). Obrigado! thanks for your comment. As I said I don’t think is a good idea to start selling Alfa Romeo without a big range of products. They should wait. The Bravo is produced in Brazil but even in that case is not popular at all, maybe the price? or maybe, as you say, is bad marketing. Keep reading! I forgot to say one little thing about Bravo. FIAT is the unique that doesn’t use a ”real automatic gear”. All Fiat Cars uses Dualogic (From Uno to Bravo), and customers doesn’t like it in cars like Bravo, since GM Cruze gives an A.T 6 gears, 308/C4 A.T 4, Focus A.T 4… This make Bravo life a bit harder. The price? Well, its the same price as 308. 308 is 1.6 engine and Fiat Bravo is 1.8 (around R$ 52.000, but you can easily find by R$ 48.000). I spoke in portuguese because my english is bad, hope you understand it. And remember, in Brazil, takes a little longer to cars be updated (Fiat Bravo took 5 years to be sold in Brazil). Very useful insight. Just one question. I’m a student and I’m conducting a research about Brazil auto market. I have looked up on many websites, but I haven’t been able to find the classification standard of cars in Brazil. In your article, there is a pie chart about different segments’ market share. Could you please help and tell me where I can find the classification standard? Thank you a lot! !